Mattie lives on a farm deep in the heart of the country. It is a quiet place, far from any city. She has no brothers or sisters or friends, and so Mattie was very, very lonely. Until the night of the secret. A secret so precious, that only she and her magic, dream world animals know about it – and this is how it all began. 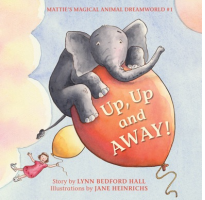 In this book, she helped Ellie, the elephant, to fly and then saved her when little Ellie somersaulted back to earth.